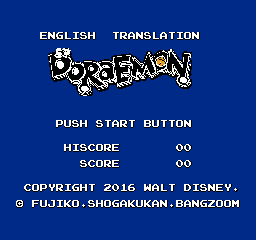 Doraemon is an Action Shooter Game in Japan that was released in 1986. It was based on a Comic or Cartoon series which is really famous. The game has 3 Levels, City Attack, Devilland, and even Underwater. but they are hard, REALLY HARD. There are hidden doors and manholes. You have to speak to the Microphone (which the NES doesn’t have it.). You have to use the Gadgets to protect yourself, pass through walls, and … heck, it’s really hard. Many People outside of Japan think this game is really bad and it was a big failure… But in real, it was a big success! The story is Simple. Four kids, Nobita, Shizuka, Suneo and Gian (English : Noby, Sue, Sneech and Big G) are kidnapped and each one was taken to three different Time Zones. Doraemon must save the lost kids. and… that’s it. There are certain Items which power up your weapons, lives, and other unique stuffs. You must Walk, Fly, Swim and Find the lost kids. It’s simple by saying but hard if you play the game. You have to use your brain. This is an English Translation of Doraemon, a famous Japanese Manga or Cartoon. There’s an existing English translation of the game by Neokid, but it doesn’t match with the animated US version. So Sky Yoshi made this translation hack from scratch. Text is modified to match the animated American version, fan subs, and some of Sky Yoshi’s own translations. The credits are also changes. It’s no longer Hudson and TV Asahi, but Walt Disney and BangZoom! They didn’t join in the game developement that time to be honest lol. The world names’ fonts are changed from the ones used from Koko Adventure/Buzz and Waldog and Toto World 3/Cave Dude. 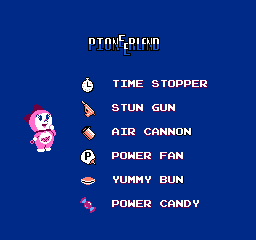 The title screen is a remake of American cartoon’s logo. The logo and title text mod is by Chief Net from 2011. 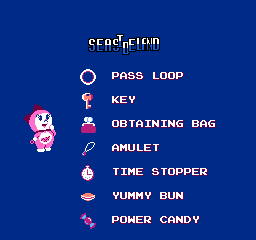 Some graphics was changed to match the US Culture such as Omamori to Amulet. 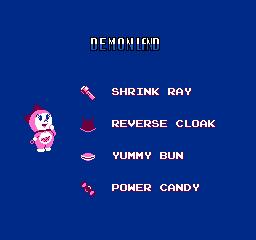 Ending Text is altered to show the Translation Staffs. These are all the changes in this hack. Good luck beating the game!